Looking for a reliable used car, truck, or SUV? Then Volkswagen Lee's Summit is the place for you. As the most trusted used car dealer near Olathe, KS, many local drivers have been counting on us to provide them with an excellent selection of used cars, trucks, and SUVs. It doesn’t stop there, though. 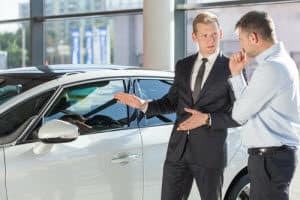 When you choose Volkswagen Lee's Summit as your used car dealer near Olathe, KS, you’ll be treated to one-on-one service from our helpful sales representatives, so you can focus on finding the used car, truck, or SUV you need. At Volkswagen Lee's Summit, we strive to offer only the most reliable selection of used cars, trucks, and SUVs, so you know that any vehicle you choose will be working for you for years to come. We also keep a variety of vehicles in many makes, models, and years, so you have the options to find the one that’s best for you. When you come to us for your used car search, our sales representatives will meet with you to learn more about what you’re looking for in a used car. With so much variety, it’s comforting to have the guidance of an experienced professional who knows these vehicles inside and out, like our friendly team at Volkswagen Lee's Summit. Once you’ve found the perfect vehicle for you, visit the finance center at Volkswagen Lee's Summit to learn what financial options are available. Our financial specialists will discuss your budget and needs to find you a great rate on your auto loan, so you can leave our dealership with the comfort and security of knowing you got a competitive rate on your used car purchase. No matter your credit situation, we can still help you save money and get the car of your dreams. With our range of competitively priced used vehicles in a variety of makes, models, and years, as well as our expert team of financial specialists, we can get you an excellent deal on the best car for you. At Volkswagen Lee's Summit, our dedication to you doesn’t end when you find a used car. We want to help you care for your vehicle properly, so it’ll run like new for as long as possible. The best way to accomplish this is through routine maintenance from our service technicians. Our service technicians not only have the most current training and tools to perform all the necessary repairs and maintenance, but they’re also experienced with the care and service used vehicles need to stay in peak condition. We want to protect your investment, so come to our service center to discuss your used vehicle’s routine maintenance needs and set up a service appointment today. When you’re searching for a used car, truck, or SUV, look no further than Volkswagen Lee's Summit, your trusted used car dealer near Olathe, KS. Many local drivers count on us for all their used vehicle needs, so contact us today to see how we can help you!